Performances will take place on Wednesday at 8:00pm, Thursday at 8:00pm, Fridays at 8:00pm, Saturdays at 2:00pm & 8:00pm, and Sundays at 2:00pm. One of the most popular Disney movies of all time is capturing hearts in a whole new way: as a practically perfect musical! Based on the books by P.L. Travers and the classic Walt Disney film, Disney and Cameron Mackintosh’s Mary Poppins delighted Broadway audiences for over 2,500 performances and received nominations for nine Olivier and seven Tony Awards, including Best Musical. The jack-of-all trades, Bert, introduces us to England in 1910 and the troubled Banks family. Young Jane and Michael have sent many a nanny packing before Mary Poppins arrives on their doorstep. Using a combination of magic and common sense, she must teach the family members how to value each other again. Mary Poppins takes the children on many magical and memorable adventures, but Jane and Michael aren’t the only ones upon whom she has a profound effect. Even grown-ups can learn a lesson or two from the nanny who advises that “Anything can happen if you let it.” Mary Poppins is an enchanting mixture of irresistible story, unforgettable songs, breathtaking dance numbers and astonishing stagecraft. Irving Berlin’s HOLIDAY INN tells the story of Jim, who leaves the bright lights of show business behind to settle down on his farmhouse in Connecticut… but life just isn’t the same without a bit of song and dance. Jim’s luck takes a spectacular turn when he meets Linda, a spirited schoolteacher with talent to spare. Together they turn the farmhouse into a fabulous inn with dazzling performances to celebrate each holiday, from Thanksgiving to the Fourth of July. But when Jim’s best friend Ted tries to lure Linda away to be his new dance partner in Hollywood, will Jim be able to salvage his latest chance at love? Based on the classic film, this joyous musical features thrilling dance numbers, laugh-out-loud comedy and a parade of hit Irving Berlin songs, including “Blue Skies,” “Easter Parade,” “Steppin’ Out With My Baby,” “Heat Wave,” “White Christmas,” “Be Careful, It’s My Heart,” “Cheek to Cheek,” “Shaking the Blues Away” and many more! 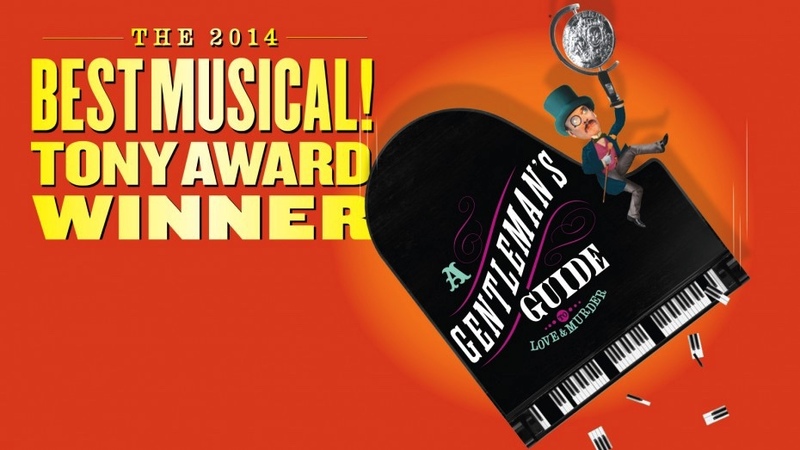 Gentleman’s Guide to Love and Murder is the knock-’em-dead, uproarious hit and the most-nominated show of the 2014 season. With ten Tony nominations and four wins, including Best Musical, Book, Direction and Costumes, it also earned seven Drama Desk Awards (including Best Musical), four Outer Critics Circle Awards (including Best Musical) and one Drama League Award (Best Musical). When the low-born Monty Navarro finds out that he’s eighth in line for an earldom in the lofty D’Ysquith family, he figures his chances of outliving his predecessors are slight and sets off down a far more ghoulish path. Can he knock off his unsuspecting relatives without being caught and become the ninth Earl of Highhurst? And what of love? Because murder isn’t the only thing on Monty’s mind…. A Gentleman’s Guide to Love and Murder is a murderous romp filled with unforgettable music, non-stop laughs and a scene-stealing role for one actor playing all eight of the doomed heirs who meet their ends in the most creative and side-splitting ways. Sister Act is the feel-good musical comedy smash based on the hit 1992 film that has audiences jumping to their feet! Featuring original music by Tony- and eight-time Oscar winner, Alan Menken (Newsies, Beauty and the Beast, Little Shop of Horrors), this uplifting musical was nominated for five Tony Awards, including Best Musical. When disco diva, Deloris Van Cartier, witnesses a murder, she is put in protective custody in the one place the cops are sure she won’t be a found: a convent! Disguised as a nun, she finds herself at odds with both the rigid lifestyle and uptight Mother Superior. Using her unique disco moves and singing talent to inspire the choir, Deloris breathes new life into the church and community but, in doing so, blows her cover. Soon, the gang is giving chase, only to find them up against Deloris and the power of her newly found sisterhood. Filled with powerful gospel music, outrageous dancing and a truly moving story, Sister Act will leave audiences breathless.